As ThinkFirst voice for injury prevention Cecelia Fred, left, listens as Jodee Dennison, ThinkFirst Navajo chapter director, reads the safety pledge to To’Hajiilee students before they were given specially fitted bicycle helmets. According to a four-year report by the Navajo Epidemiology Center, unintentional injuries are one of the leading causes of death on the Navajo Nation. The major forms of injuries are from car crashes, pedestrian accidents and drowning. 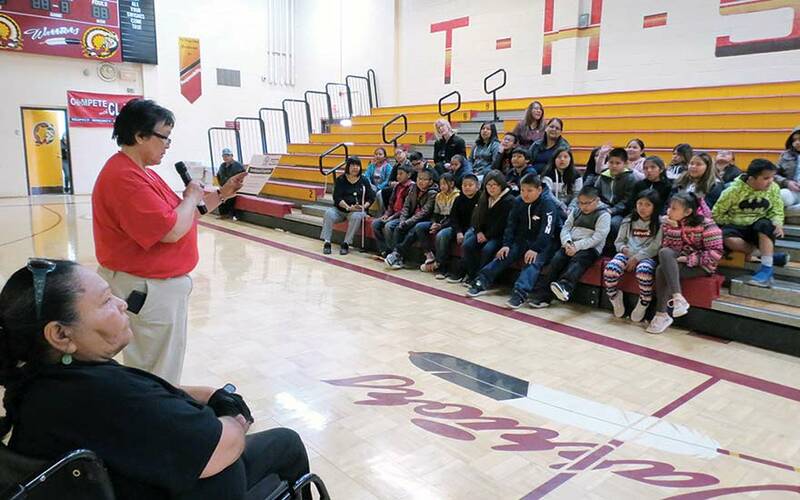 As part of the presentation in the school’s gym, Cecelia Fred, Diné, one of several ThinkFirst VIPs (voice for injury prevention), shared with the students how she was injured. “I wish I could get up and walk over to where you are and sit down, but I can’t do that,” she said, adding that she’s been wheelchair bound since she was a young girl about their age.